The latest year-to-date enrolment data for Australia paints a picture of continuing growth as the halfway point in the year approaches. Department of Education and Training (DET) numbers for YTD May 2017 show overall commencement growth of just over 12%. 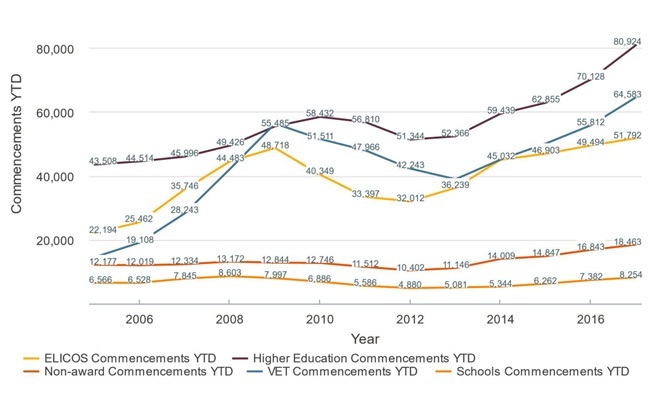 Building on equally strong commencement growth through 2015 and 2016, total enrolment numbers are up even more through May with a nearly 14% increase compared to the year before. As the following chart illustrates, the higher education and VET (vocational education and training) sectors account for most of this growth through May, with most other sectors registering more modest gains. A closer look behind the numbers reveals that just four markets – China, India, Nepal, and Vietnam – drove nearly all of the growth in higher education through May. In VET, meanwhile, China, South Korea, and Brazil lead the way with the greatest YTD growth. In fact, Brazil is an interesting part of the story so far this year. In a further indication of its strengthening outbound market, Brazil is one of the fastest-growing sending markets for Australia overall with nearly 12,000 commencements in the first half of 2017 and a 23% increase in programme starts compared to the year before. Other than China and India, which remain solidly entrenched at the top of the source market table, the other notable growth markets this year are Nepal (10,000 commencements YTD and 83% growth), Malaysia (also with about 10,000 new students and 18% growth), and Colombia (just over 7,000 commencements and 26% growth). In terms of total enrolment growth among Australia’s top ten sending markets, the big gainers through May are China (18%), Malaysia (18%), Nepal (47%), and Brazil (26%). These latest DET numbers follow another important indicator from the Australian Bureau of Statistics (ABS) earlier this month. ABS reports that the total value of international student spending in Australia, including tuition fees, accommodation, and other expenses, rose by nearly 19% in 2016 to reach AUS$24 billion (US$19 billion). Needless to say, this all adds up to an impressive showing in the early stages of implementation for Australia’s National Strategy for International Education 2025. The national strategy is a comprehensive ten-year blueprint for the expansion of Australia’s international education sector. Among other key goals, the strategy aims to expand onshore foreign enrolment to 720,000 students by 2025. This entry was posted in Australia, Australia/Oceania, Higher Education, Regions, Vocational and tagged vocational education and training sector, higher education enrolment, international students, Vocational Education and Training, ELICOS enrolments in Australia.